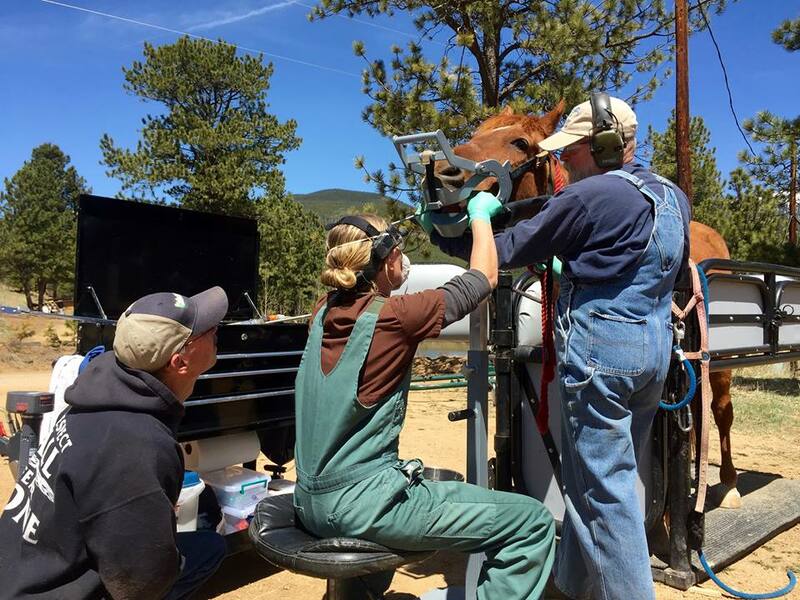 Advance Equine Dentistry believes in preventative care being the key to your horse maintaining a healthy mouth. 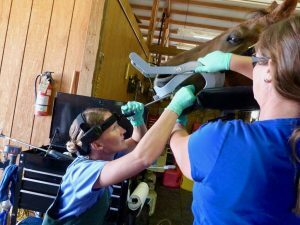 Each appointment is broken up into two parts; a physical examination of the horse to assess its overall condition, then the float. The dental examination consists of a five step procedure to identify oral pathology and initiate a plan for any potential issues. 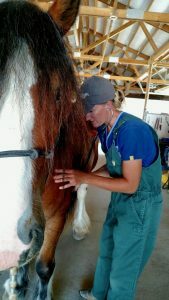 We begin with a physical exam of your horse including temperature, heart-rate, and listening for gastrointestinal sounds. 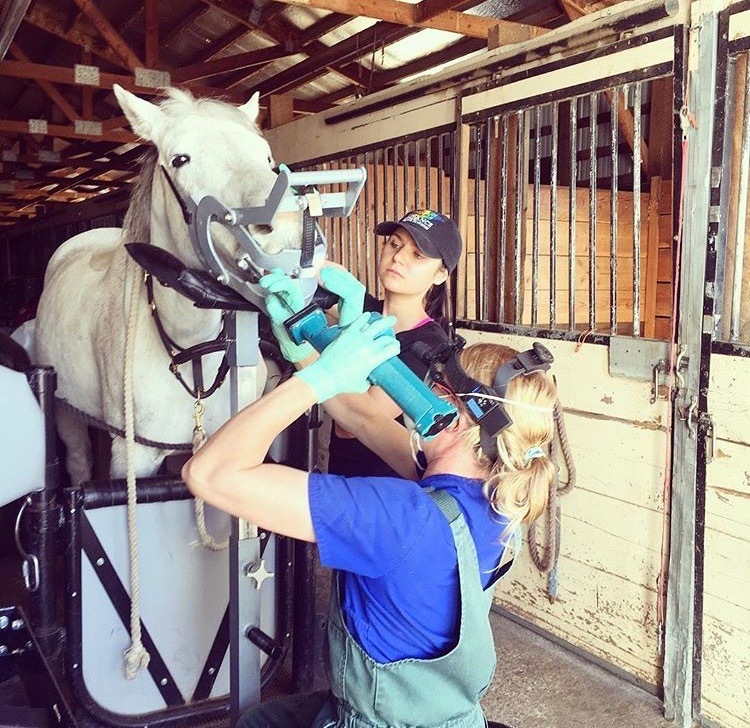 We then evaluate the horse’s facial structures, nose, and eyes to ensure there is no abnormality that should be considered before proceeding forward. 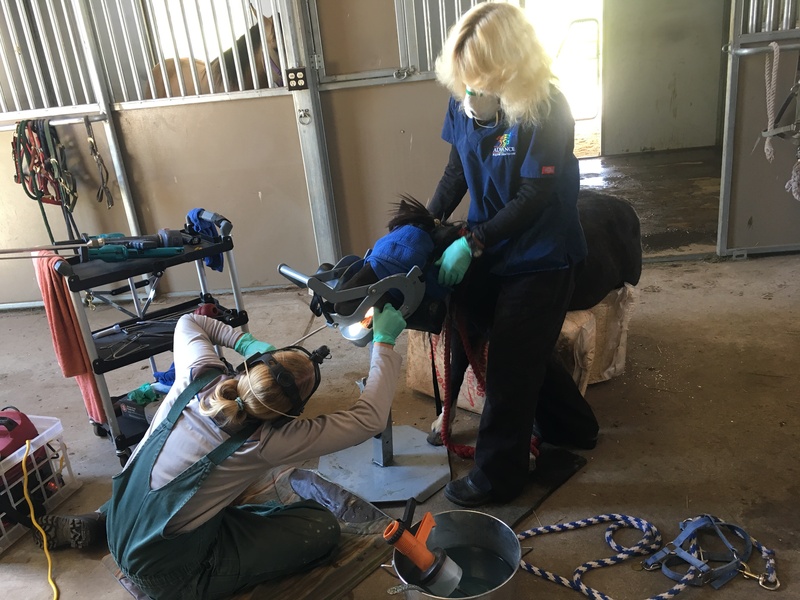 If the physical exam is within normal parameters, we will sedate the horse and slowly move them into the stocks for examination. 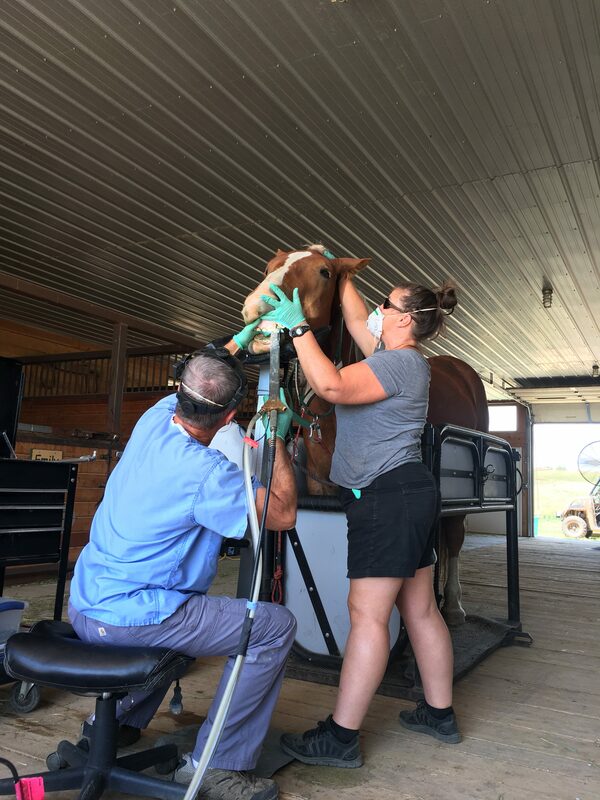 After sedation, we rinse and feed material out of the horse’s mouth and we place on a speculum, a device that allows for us to safely work within the horse’s mouth, then proceed to the oral exam. Evaluation of the then gingiva, tongue, hard / soft palate, tooth structure & any abrasions / ulcerations caused by sharp dental points or tooth abnormalities. Refers to the grinding surface of the teeth where both upper and lower teeth meet. Poor grinding function can often be caused by an abnormality of the occlusal surface, which can be a result of a larger dental issue that should be addressed. Refers to the structures surrounding the teeth such as gingiva and the periodontal ligament. 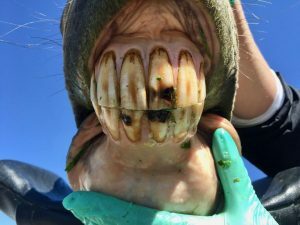 Just like humans, horses can have issues affecting the health of the gingiva that may lead to not only periodontal disease but potentially larger problems in the mouth. 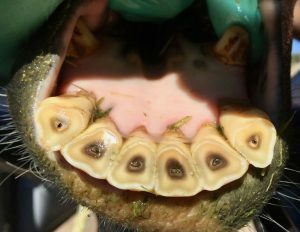 Horses can also develop spaces between the teeth (diastemas) where food can pack and eventually lead to gum disease. If gum disease goes untreated it can cause recession, bone / tooth loss, and or more serious affects such as infection. Derived from the Greek roots endo – “Inside” and odont – “tooth,” this is the evaluation on the dental pulp which contains the nerves, blood, and lymphatic vessels supplies to the tooth. Often when a fractured tooth is present, the pulp of the tooth may be damaged. Depending on the tooth affects and radiographic interpretation, various treatment options are considered. Such treatment options include, extraction, root canal therapy, vital pulp therapy or pulp capping. On exam, we can detect many superficial changes that may indicate a larger issue, however, to formulate a treatment plan radiographs are typically recommended. After the examination, a treatment plan is formulated and we will begin the float. 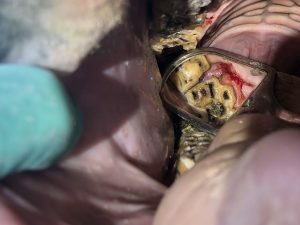 Horse owners often refer to the actual dental work as “floating.” “Floating” is a masonry term that means to “smooth out,” as in smoothing the sharp enamel points on the outside of the upper cheek teeth and the inside of the lower teeth. More appropriate terminology for complete and proper dentistry, rather than “ﬂoating,” may be the comprehensive ﬂoat, occlusal equilibration, or balancing the mouth. Regardless of the name you prefer there is much more to routine dentistry than removing enamel points! 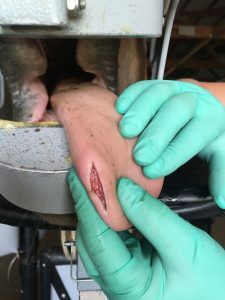 It also involves examining the horse’s entire mouth then addressing sharp enamel points, abnormalities in occlusion (how the teeth come together), soft tissue trauma, periodontal and endodontic problems. The appointment will conclude with a completed dental chart that documents the examination results, procedures performed, and future recommendations. This is provided to the owner at the end of the appointment.